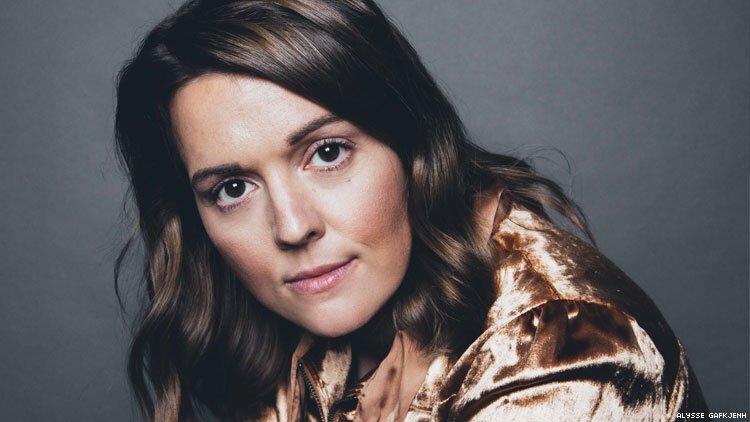 On a balmy night this summer, singer-songwriter Brandi Carlile stepped out on to the stage at Los Angeles's Greek Theater and delivered a pared down, soaring rendition of Joni Mitchell's "A Case of You." The audience remained silent and rapt, shouting only the occasional "woot" of approbation during a pause in the vocals. For years, Carlile has been interpreting tunes from the de facto queen of folk music and introducing new fans to Mitchell's unparalleled lyricism at her shows, so its both kismet and somehow pre-ordained that she's slated to perform with about a dozen legends at Joni 75: A Birthday Celebration Live at the Dorothy Chandler Pavilion in Los Angeles on Wednesday. Beyond landing the gig of a lifetime paying homage to the singer-songwriter who rose to fame as part of a handful of Laurel Canyon denizens who ruled the music scene in the late '60s, and who will likely be in attendance at the concert, Carlile's music and career follows a long line of poets with guitars or a piano who've raised their voices and their platforms to highlight the plight of the marginalized. "It's a cliche to say you have a responsibility to use your platform to a certain extent. But it's a cliche for a reason because it's just absolutely true," Carlile told The Advocate about the connective tissue between music and activism. "Just when I think I'm using my platform for forgiveness, I'm using it for politics and just when I think I'm using it to describe love or heartbreak or death, I'm really describing the sustainability of my family in the tumult going on in the country right now. They're all really intertwined. They change meaning every time," she added. Speaking with The Advocate in the wake of the contentious hearings around Brett Kavanaugh's confirmation to the Supreme Court, and the ugly rhetoric around survivors of sexual abuse that followed, Carlile was primed to discuss politics and how musicians (particularly in the folk tradition) have long carried a mantle of activism for people in need. An out lesbian throughout her career, Carlile has been married to her wife Catherine Shepherd since 2012. The women are raising two young daughters, so political and social activism are part and parcel of Carlile's music and the message she delivers on stage. While not renowned as the most political of singer/songwriters in the way that Bob Dylan, Woody Guthrie, or Joan Baez have been, Mitchell is an indisputable major influence in the canon of thoughtful music of healing and resistance. But Carlile said her journey to fully digest and understand Mitchell's music was about 10 years in the making after producer T-Bone Burnett introduced her to Mitchell's 1971 opus Blue, while Carlile was recording The Story in 2007. "It's one of those reckonings where I've been so moved and so taught by Joni Mitchell over the course of my adult life that it's going to be a real honor to sing her songs and perhaps even have her witness that," Carlile said about performing at the concert. "I got Blue molecularly and I got it for real years ago and started meditating on Court and Spark," Carlile said, adding that she's a "late bloomer" when it comes to Mitchell. "That album and a couple of the tracks on Blue are what really influenced so much of the writing on my recent album By the Way, I Forgive You." Released in February of this year, the title track for By the Way, I Forgive You is Carlile's reflection on grace and compassion in the face of oppression, inspired by her move toward forgiving the minister who refused to baptize her in her teens because she's gay. "It's important to know that the religious right doesn't have a monopoly on forgiveness anymore, or the word - a buzzword like 'blessed,' or words that we connote with white privilege," Carlile said. "It [forgiveness] is in danger of being one of those words when its a radically brave concept to forgive something or someone who's not even sorry, or to forgive yourself or to forgive life taking your parents away and being what it is," she said of letting go, especially amid the current political climate. While the notion of forgiveness on the title track of the album is all Carlile, Mitchell's influence can be felt in the lyricism and the freedom in not being "phonetically held to the rhythm that Court and Spark represents" for her, she said. For those paying close attention, Carlile's track "The Joke" includes a lyrical allusion to Mitchell's melancholy holiday meditation "River." "You gotta dance on a river to beat the stream," is "The Joke's" nod to Mitchell, Carlile said. The concert to celebrate Mitchell's 75th birthday is, on its surface, an upscale event at a fancy venue, but the gathering together of musicians to tell a story or send a message that's bigger than the music is straight out of the tradition of Woodstock, and the annual Newport Folk Festival. James Taylor, Emmylou Harris, Seal, Chaka Khan, Rufus Wainwright, Diana Krall, and Kris Kristofferson are just a handful of those, along with Carlile, who are slated to perform Mitchell's songs. Carlile, who just enjoyed a cameo in the Lady Gaga/Bradley Cooper blockbuster A Star Is Born, is on the bill to perform "Down to You" from Court and Spark. She's also slated to perform "A Case of You" with Kris Kristofferson, a duet she said is "a once-in-a-lifetime collaboration I can't even deal with." Beyond the joy in performing from the Mitchell songbook for Mitchell in the audience, Carlile recognizes the great tradition of messaging through music but added that it was an older lesbian who pointed out to her during the early days of Barack Obama's presidency that younger folks were too complacent. It was then that Carlile realized that she'd never penned a political song. "Everything feels too good right now in this country. You kids need to wake up. We had Buffy [Sainte Marie] and Dylan and Joni and Leonard [Cohen], and we had these pioneers because of the unrest of the Vietnam war and the political problems we were facing in the '60s and '70s," Carlile said the woman told her. "You have them but you don't see them so you're not writing about them." "It really stuck with me. I'd never written a political song or even made a political reference in my career up to that point," Carlile said. "For the last couple of years we've been experiencing this whiplash from this wokeness that we're all starting to realize is happening." With the Kavananaugh hearings in the rearview and ahead of the midterm elections in which the left is pulling for a "Blue Wave" of Democrats to take back Congress, Carlile hailed the power of using one's platform for change. She praised pop star Taylor Swift (who was previously fairly apolitical) who recently came out as a Democrat and used her voice to urge fans to vote against Marsha Blackburn, the homophobic Republican running for the Senate. Beyond the election, Carlile is socially and politically motivated to the core, but with two daughters to raise, she's working especially hard to level the playing field for women. That includes having organized a Lilith Fair-like festival of all women performers. Her Girls Just Wanna Have Fun Weekend kicks off in Mexico in January with performers including Patty Griffin, the Indigo Girls, Secret Sisters, and KT Tunstall and is intended to send a message to promoters - much like Sarah McLachlan's Lilith Fair did in the '90s - that women have earned and deserve a spot on the bill. A songwriter with a penchant for soulful, mournful, and joyful lyrics, Carlile's themes of forgiveness and activism can't be extricated from one another. Whether its purposeful or not, her work has mirrored Mitchell's in terms of being both a salve and a firebrand. "It's so intertwined with Joni sometimes I don't know where one begins and the other ends," she said of Mitchell's music to heal and send a message. "She [Joni] is peerless. She has no contemporaries." This article has been viewed 638 times since being added on February 11, 2019.